NEW PROVIDENCE — The winners of the TransOptions Hydrogen Fuel Cell Model Car Challenge were announced both at the meet and by email Thursday. Awards were presented to the winners at the conclusion of the races in the categories of speed, progress journal, craftsmanship and engineering. The top winners were members of Team Quick Silver from Union County Magnet High School. See a video of the winning team talking about their win here. 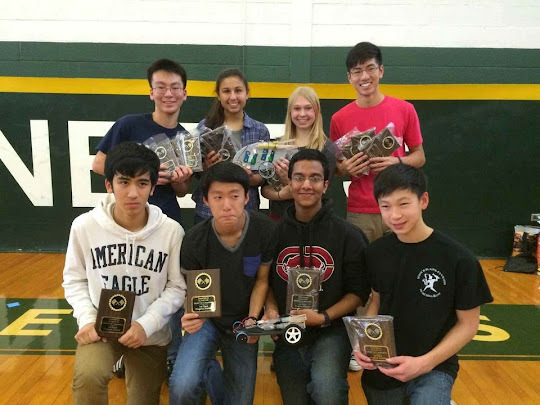 1st Place – “HyDrive” – Union County Magnet High School – Adel Setoodehnia, Benjamin Liang, Daniel Pattathil and Ethan Cheung. STEM (Science, Technology, Engineering and Math) learning came to life for more than 145 high school students who participated in TransOptions’ Hydrogen Fuel Cell (H2) Model Car Challenge, powered by Linde, on Dec. 17 at New Providence High School, on New Providence. The 8th annual H2 Challenge was hosted by TransOptions, the Transportation Management Association for northwestern New Jersey, to promote technology in education and foster student interest in STEM learning. The Challenge was originally developed by the U.S. Department of Energy for their annual National Science Bowl competition. “Hosting the Challenge is part of our ongoing commitment to support environmental education and inspire high school students to explore careers in engineering and science,” said John F. Ciaffone TransOptions’ president. “We are extremely grateful to The Linde Group for their support and sponsorship this year,” he added. As race day began, each of the 42 teams from 14 area schools stopped at the judges’ table where a panel examined their model car on craftsmanship and engineering. Each team also presented their Progress Journal that documented the concepts, designs and development of their model car. Prior to their race, teams huddled at the starting line to power their model car’s fuel stack by producing hydrogen through a process known as electrolysis. Students then competed against each other, racing their cars down a 33-foot-long track.